Sandals Royal Plantation is a luxury beach getaway in Jamaica , offering 74 suites reminiscent of the glamorous 50s. A unique service at the resort are beach butlers who deliver drinks, snacks and answer other requests. The hotel is popular with honeymooners since every suite offers romantic ocean views. The European-style spa at the resort offers steam baths, massages, detox treatments and more. At Red Lane Spa you can enjoy getting pampered in the specially designed treatment rooms, in your suite or on the sand while listening to the waves. 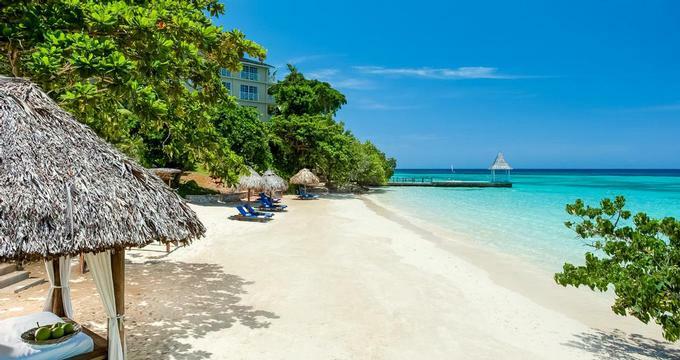 The hotel is located in Ocho Rios on Jamaica's lush north coast on a white sandy beach compete with luxury beach chairs, thatched umbrellas and scenic views. The resort is a member of the Leading Small Hotels of the World. During the day, enjoy number of ocean based activities, such as kayaking, windsurfing, sailing, snorkeling, glass bottom boat tours, hobbie cats and scuba diving on your beach trip. There is also a wide selection of land based activities, such as tennis (the courts are lighted for night play), golf, billiards and a fitness center. Scuba diving is complimentary for certified divers. If you would like to get certified, classes are offered at the resort but they cost extra. There are several great dive sites. If you would like to improve your dive knowledge, there are night dives and other specialty fives offered at the resort. The daily rate also includes golf at the Sandals Golf & Country Club. Roundtrip transfers to the golf course are also included from Sandals Grande Ocho Rios. Dining choices include authentic Mediterranean and Jamaican cuisine, as well as traditional Jamaican light fare. Sandals Resorts and the famous event planner Preston Bailey have partnered to create Preston Bailey Signature WeddingMoons™ packages. Preston is known for putting together incredible celebrity events for Donald and Melania Trump, and Michael Douglas and Catherine Zeta-Jones. WeddingMoons™ packages are offered at Sandals and Beaches Caribbean properties. The packages feature design elements by Preston Bailey, such as a unique setting for the ceremony, specialty cakes, beautiful flower arrangements, table decor and keepsakes for the bride, groom and guests. Available offers include the Floral Elegance Collection, the Water Lilly Collection, the Seascape Collection and the Crystal Collection. Suite rates start from US$1,310 per night.